This is my final day in the 30 Day Challenge. 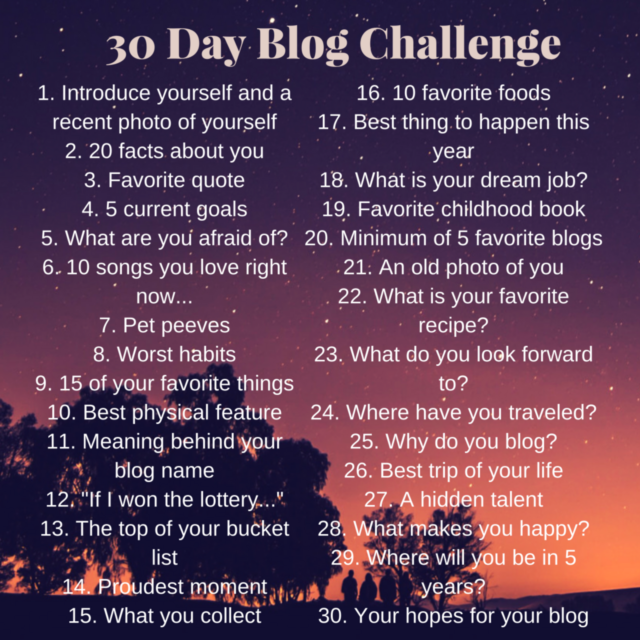 My goals for this challenge were to get me more in the habit of posting regularly, inspire some new writing topics, and learn about myself. Mission accomplished, I would say! This has helped me plan out my posts and use the beauty of scheduling posts. Now I have a calendar of my planned posts, and I can really go back to focusing on my adventures! My hopes for my blog are to document my life as its happening. I want to write about my travels and adventures, wedding planning, and all of my “adulting” adventures that are ahead of me. It’ll be great documentation for later in life. If it could help someone else during these similar times, that’s even better! The blog keeps me accountable to constantly be growing in my life and improving myself. It’s also allowing me to have a personal hobby that I can feel accomplishment in. I’m finally getting to the point where I am ready to show my blog and all my hard work the past few months to my friends and family. I’m learning more about web design, graphic design, and photography. These are all awesome skills for me to develop in my field, and life in general. I really hope to develop more of a following on this site, but take it or leave it. I am staying true to myself regardless of what happens moving forward.